Kuwait - 2 April 2019:- Abdulmohsen Abdulaziz Al-Babtain Co., the sole authorized dealer of Nissan in the State of Kuwait recently celebrated its solid and successful partnership of one of the most trusted brands in Kuwait with its key clientele during the “Nissan 10th Annual Aftersales Customer Awards Ceremony” held at the Crown Plaza Hotel, on March 27th, 2019. This year, the annual event witnessed a grand celebration of a decade of excellence that honors its customers and clients responsible for Nissan’s sustained progress as well as 70 years of success by the homegrown conglomerate. Customers were rewarded and entitled to enter a raffle draw and win 10 valuable prizes. 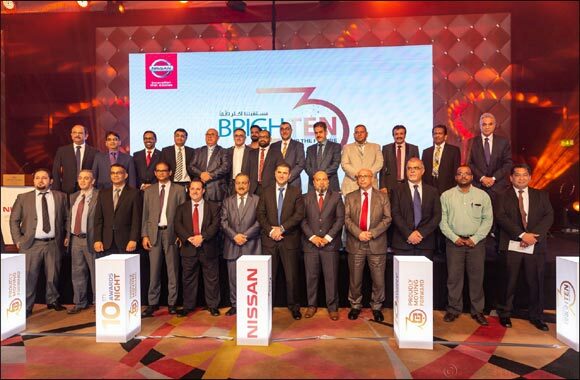 The “Nissan 10th Annual Aftersales Award ceremony” was attended by General Manager Automotive Division at Abdulmohsen Abdulaziz Al Babtain - Laurent Pernet, Mr. Surendra Acharya - General Manager – Aftersales Nissan Gulf & Mr. Sanjeev Aggarwal - Director Aftersales (NMEF), as well as Al Babtain top management in the Sales and Aftersales. Business community leaders from different industries, senior officials, government officers, and Nissan vehicle owners were also present. Al Babtain Automotive GM – Laurent Pernet said, “At Al Babtain, our commitment with Nissan is to provide best in its class service for the large and growing Nissan customer base in Kuwait. One of our main focus is to provide Nissan Aftersales services at very competitive, affordable prices with quality, reliability for peace of mind driving. This is our daily job and our commitment. For 70 years Al Babtain has represented and developed the brand Nissan in Kuwait: 70 years of presence, this is an exceptional sign of loyalty and dedication, an exceptional sign of belief in the Brands, including Infiniti and Renault, and their products. And despite our old age, we keep moving the business forward and more than ever excited when me meet our best and long term partners. Particularly delighted to be here with you to celebrate our 10th event, bringing together customers from various segments of the market, mainly from Fleet wholesale, Government organizations, insurance and independent garages, retails shops. A leading name among all segments and demographics in Kuwait, Al Babtain Group is headed by its full-fledged dedication to customized, state of the art services that have earned it a solid reputation locally and regionally. Al Babtain Group now represents some of the world’s major international corporations and distributes a wide variety of products & services. Marking its 70th year, the Group has experienced continued recognition, owing to its advanced flexible management style and long-term vision. The astounding results were achieved due to a versatile strategic formula focusing on growth amongst its sphere of activities; including automotive, technology, investment, information technology, industrial and Finance. Presently, Nissan Kuwait has the largest Aftersales Service and Parts Network in the State of Kuwait with 8 quick service centres, 3 main service centres and 2 body repair centres, in addition to 13 parts outlets established in strategic locations for easier accessibility. The latest addition to the wide network is the designated Nissan Quick Patrol Workshop, to support the needs of its expanding clientele in Kuwait.